SASKATOON, SK, September 16, 2016 – Canadian Business and PROFIT ranked ProjectLine number 310 on the 18th annual PROFIT 500, the definitive ranking of Canada’s Fastest-Growing Companies. 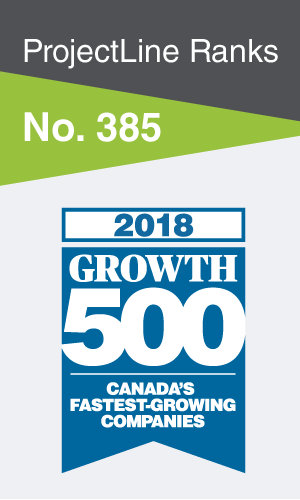 Published in the October issues of Canadian Business and at PROFITguide.com, the PROFIT 500 ranks Canadian businesses by their five-year revenue growth. ProjectLine made the 2016 PROFIT 500 list with five-year revenue growth of 174%. We are a solutions provider that specializes in the implementation and support of software systems that improve business performance. As an SAP gold partner that has been in business since 2001, we have provided clients in Canada and the United States with world-class software solutions and business consulting services that have enabled them to grow their businesses and be more profitable in today’s competitive business market. To learn more about how ProjectLine improves business management with SAP Business One, resulting in enhanced quality and streamlined decision making, visit www.projectline.ca. Founded in 1928, Canadian Business is the longest-serving, best-selling and most-trusted business publication in the country. With a total brand readership of more than 1.1 million, it is the country’s premier media brand for executives and senior business leaders. It fuels the success of Canada’s business elite with a focus on the things that matter most: leadership, innovation, business strategy and management tactics. We provide concrete examples of business achievement, thought-provoking analysis and compelling storytelling, all in an elegant package with bold graphics and great photography. Canadian Business – what leadership looks like. SAP Business One is the registered trademark of SAP AG in Germany and several other countries.